GreenEcoSavers, LLC is a green business that embraces and promotes sustainability, energy conservation, recycling and the reduction of pollution in our precious planet. We strongly believe that raising awareness among consumers is a very important aspect of promoting green, eco-friendly and energy savings products. Our team members have extensive experience in the energy conservation industry and believe that every one of us can make a difference. Our mission is to promote energy efficiency and help to reduce the effects of global warming. We cater to the needs of green-conscious and eco-conscious customers who truly believe that they can make a difference and take responsibility to do their part. The criteria for selecting the products that we offer are energy and water saving characteristics, low mercury levels for light bulbs, favorable life cycle costs based on a life cycle analysis including long term operational costs, safe disposal and recycling qualities. We offer products from name-brand companies who are the industry leaders in sustainability and environmental corporate responsibility and have already made commitments to uphold the green and sustainable standards by which they run their companies. We use recycled shipping boxes and eco-friendly packing materials. We also make an effort to choose the smallest possible boxes that can hold the products safely during transit to reduce the transportation costs and benefit from the associated reduction in the emissions. 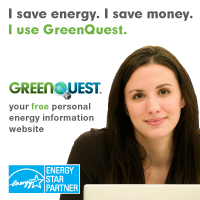 GreenEcoSavers, LLC is proud to offer our customers products with the ENERGY STAR label. We are committed to continually improving our management of energy resources, which reduces both operating costs and related forms of pollution. We are proud to be part of the family of businesses who have also joined with ENERGY STAR. GreenEcoSavers, LLC is a Carbonfund.org’s partner and is helping reduce the threat of climate change for our and future generations. CO2Stats is an eco-friendly web badge that calculates your website's environmental footprint, finds ways to make your site more energy-efficient, automatically neutralizes its calculated carbon footprint, and displays the widely recognized Green Certified Site trustmark. CO2Stats calculates the combined electricity used by computers visiting this site, the servers providing it, and the networks that connect them. CO2Stats then helps to make this site more energy efficient (and load faster), and automatically neutralizes the carbon emissions due to generation of that electricity.